There were a few wonderful moments in China and Taiwan where I was able to sit for an hour or more, sipping tea with people who were complete strangers when we entered their shop, chatting about the qualities of tea and about the world as gaiwan after gaiwan was poured. A wonderfully forthright lady in Lijiang, a tiny shop in Kunming, a friendly gentleman in Dali, a flute-playing family in Liu’An, a group of expert tea women in Shanghai… the list goes on. At each place when the tea started flowing I felt that I was in the company of good friends. And the tea! Such infusions of subtle and delicate beauty that I was humbled and enlightened all at once. These hosts gave just as much from their leaves as from their hospitality. Though not exactly common in Asia, such experiences can be found if you visit enough tea shops. So far in the US, that has not been my experience, and understandably so: tea is an emerging industry in the States and for a (so far) strictly imported product the cash flow part of running a tea business must be seriously considered. It’s a difficult nut to crack if you want to offer really premium full leaf tea to customers, many of whom can’t get their mind past the humble 25 cent tea bag. Not that there aren’t adventurers among us, but in general the United States population is only beginning to be curious about unsweetened, unblended, full-leaf, skillfully prepared tea. So today I was happy to have an experience on a quiet street in San Francisco that brought me right back to those shops in Muzha and Dali. Song Tea and Ceramics is a small beautiful oasis in the busy city. Just a few blocks from Japantown in a pleasant mostly residential neighborhood, Song Tea’s large glass windows allow passer-by to admire their beautiful wooden shelves full of handmade Taiwanese and Yixing teaware. After lingering over their tea selection with a cup of cold-brewed Winter Sprout Lishan oolong (without a doubt the tastiest cold tea I’ve had with the possible exception of Happy Tea which I will certainly write about one of these days), we sat down to a tasting with Amanda, one of the three folks who run the shop. As I’ve been digging into Hong Shui style oolong lately, our first cups were a pair of Lishan-grown Hong Shui rolled oolongs from 2013 and 2014 respectively. The first was a Tieguanyin cultivar and the second a Shui Xian. I’m not sure I’ll ever be an expert in what tea is grown where because I had no idea that those cultivars were even grown on Lishan, let alone processed as Hong Shui. As far as I’m aware most of the Lishan oolong I’ve tasted has been Qingshin or Jinxuan. Nevertheless, here were examples of very skillfully produced Taiwanese versions of what were traditionally Fujian and Guandong leaves, right in my cup. 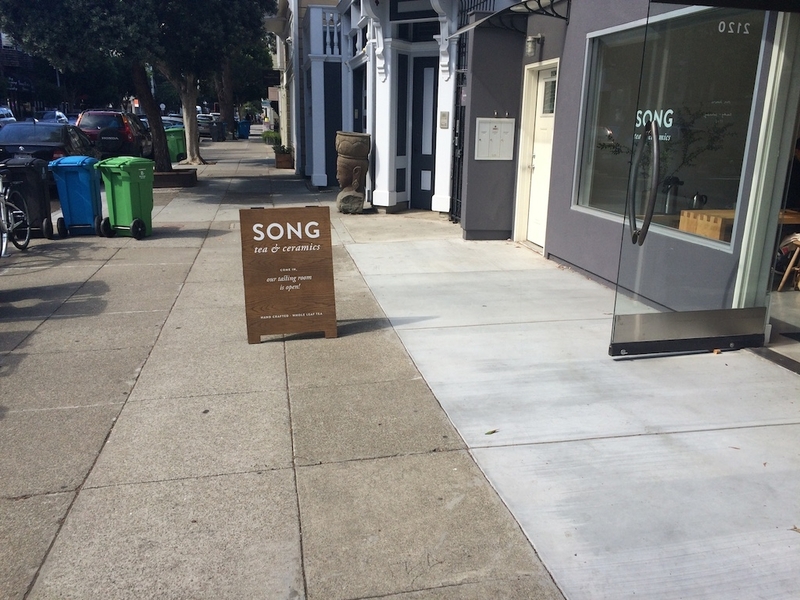 To say that I was disappointed by any tea I tried at Song Tea would be a lie. Clearly they use a great deal of care choosing their leaves and their selection is probably one of the most unique in the city, if not most of the country. Well done, Peter and friends! The Hong Shui Tieguanyin (红水铁观音) was carefully roasted and reminded me of a smoother, more creamy version of the 1995 aged Tieguanyin I got in Maokong. 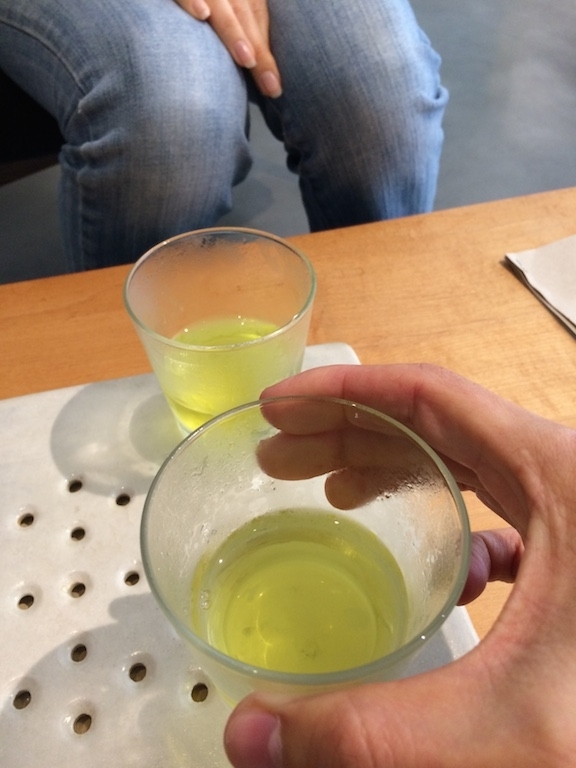 The slightly dry, metallic character that I associate with Tieguanyin was still there, but mixed in was a richer mouthfeel and some fruit flavors that became more dramatic as the infusions progressed. Near the end of our tasting we sampled a last pour of the cooled third infusion and, quite surprised, unanimously agreed that it tasted like coconut and pineapple! The Hong Shui Lishan Shui Xian (红水梨山水仙) was even more unexpected. The first taste was fruity in a way that I find difficult to put into words. Something like a brown-sugar sweetness combined with the aroma of roses. Our host called it a “funky floral” aroma, and I’d say she’s spot-on. As we neared the third infusion the taste became a bit more roasted and less sweet, though the aftertaste was long and comforting. I’d be hard-pressed to compare these two Hong Shui directly; they’re both quite unique, and easily as wonderful as the other Hong Shui I tasted recently. Is it possible that Hong Shui is always amazing? Maybe that’s just my taste buds’ bias. We had to try a hot infusion of the milky-smooth Lishan (梨山) Winter Sprout next, having so enjoyed the cold brew. To the best of my knowledge I’ve never heard of this style of harvest, but apparently some Taiwanese producers will pick their leaves in the last days of Winter, before the first flush of the plant. Of course, it requires just the right weather conditions for the tea leaves to appear at all and no doubt only a skilled and experienced grower can successfully craft those leaves into this amazing experience. The Chinese name for this type of harvest is 不知春 (bù zhīchūn), or “Never Know Spring”, which I think is a very poetic term for this craft. This tea was harvested just at the start of this year (2014), and it still has all the bright green energy of a freshly rolled oolong. After that, everything else about the infusion surprised me. The initial aroma was like steaming asparagus (and that comes from someone who loves asparagus). The closest tea aroma I could pair it with was Gyokuro, but without the smell of the ocean. It was undeniably a green high-mountain oolong, but not floral or light, instead giving forth a thick brothy body of sweet vegetable tastes. Cucumber and carrot, maybe even a bit of celery seemed to float from my cup. The glowing green liquor made me think of some of the brightest Kabusecha that I’ve ever seen, but wasn’t salty or grassy. And the leaves! The leafsets were thick and hardy as I guess I’d expect from a true winter harvest. They were almost leathery on their stalks. Although still pliable, it would take a dedicated effort to tear them. That wasn’t the end of my tasting adventures at Song Tea, but I’ll leave the rest to you, humble tea drinker, to discover on your own. It’s certainly not impossible to find other tea sipping conversations like this in the States, and indeed I’ve had a few at places like Tea Drunk in NYC and Stone Leaf in Vermont, but I’d say that Song Tea is right up there on the list of must-visit locations if you’re a tea pilgrim like me. There’s something magical and very restful about bringing a shared love of tea to the table. It’s as though these simple leaves are capable of bringing together friends who have never met, yet who have known each other for a lifetime. It wouldn’t be fair in this post to leave out the other wonderful tea shops in and around the Bay Area, but I’ll devote another post to describing my fun and delicious experiences at Samovar, Imperial Tea Court, and Red Blossom to give them appropriate room. Suffice to say that San Francisco is a great place to be in the Western tea world right now. I hope to visit again soon! 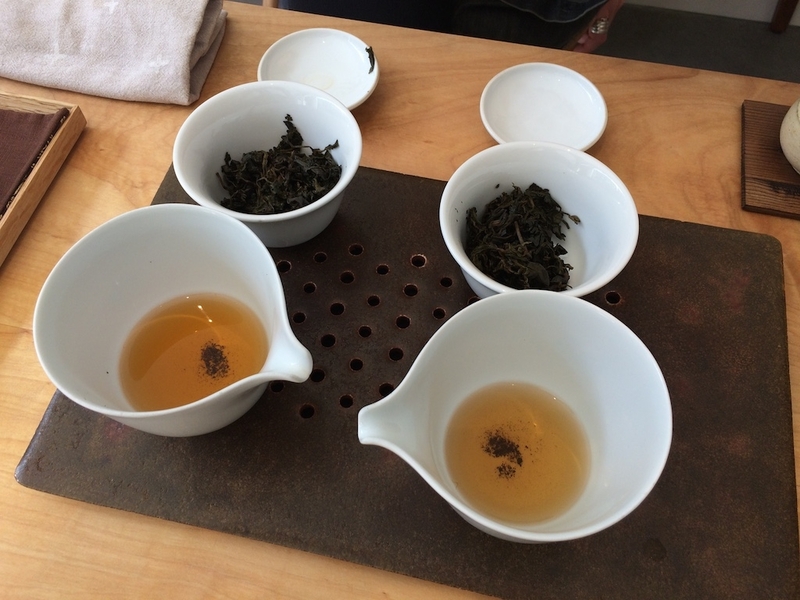 This entry was posted in Tastings, Travel and tagged hongshui, lishan, oolong, sanfrancisco, songtea, taiwan on October 9, 2014 by payton. Posts like this give me so much hope for when/if I return to the US long-term. I hope that there will be more shops like this in other regions, too! check out Far Leaves next time in Berkeley! Thanks! I went there today. Great place!